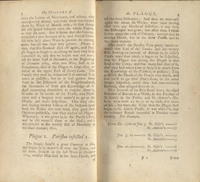 First published in 1722 under the title A Journal of the Plague Year, this work has been described variously as a novel and a nonfiction account of the 1665 bubonic plague outbreak in England. The impetus for the publication of this book seems to have been a plague that was circulating in Marseilles in 1721. 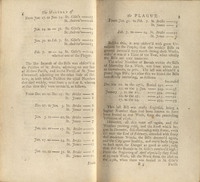 As Daniel Defoe was only five years old at the time of the plague, this work must incorporate either second-hand reports or fictionalization. Regardless of the work’s uncertain status as fiction, it has provided a rich source for scholarly analysis in fields as diverse as epidemiology, trade, grammatology, and topography. While the individuals depicted by the work may not be historically accurate, Defoe captures the struggle and suffering of the common people who lived through the plague. The realism of these accounts is reinforced by the minute details that Defoe provides, such as mortality figures for different parts of London. 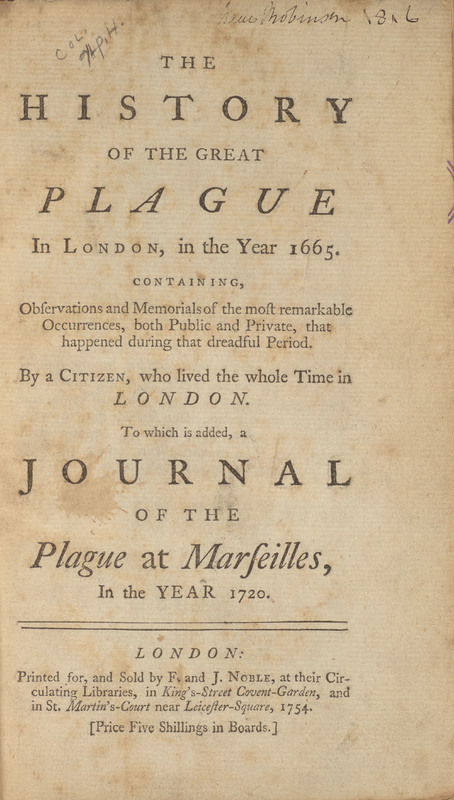 The History of the Great Plague in London, in the Year 1665. Containing, Observations and Memorials of the Most Remarkable Occurrences, both Public and Private, that Happened during that Dreadful Period. London: F. and J. Noble, 1754.